미륵사지 금동향로의 조형에 대해서는 국내의 자료가 전무하여 중국과 일본 수각형 향로를 중심으로 살펴볼 수밖에 없다. 우선 중국 수각형 향로 가운데 미륵사지 향로와 비교되는 당대(唐代)의 작품이 여러 점 확인된다. 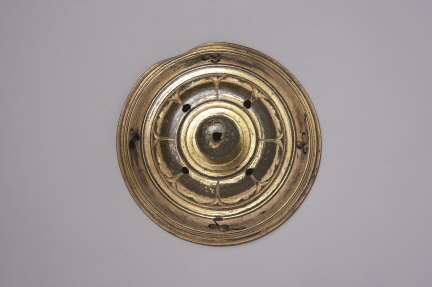 그 중에서도 6개의 다리와 6수면(獸面)을 지닌 741년의 경산사지(慶山寺址)출토의 향로가 미륵사지 향로의 조형과 유사한 점을 발견할 수 있다. 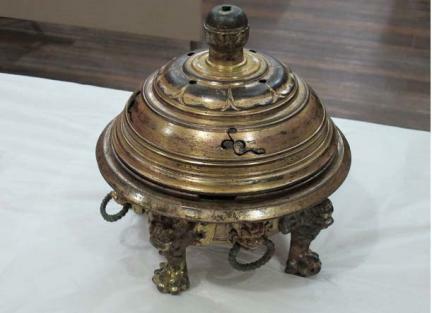 미륵사지 향로는 당대에 만들어진 중국 수각형 향로의 조형을 바탕으로 하면서도 고식의 연판 모습과 감은사지 사리감과 유사한 수면(獸面)과 고리에서 볼 수 있듯이 통일신라 초에 이루어진 여러 요소를 복합적으로 반영하여 한국적으로 수용한 작품으로 보인다. 백제 금동향로와 동일한 금·구리 아말감 도금법을 사용한 점 역시 이 향로의 제작시기를 올려보는 근거가 된다. 따라서 앞으로 보다 많은 자료와 세밀한 비교 검토가 이루어져야 하겠지만, 이 향로의 제작시기에 관해서는 불교미술과 함께 금속공예에 있어 완숙한 단계에 이르렀던 8세기 전반에서 중엽을 넘어서지 않는 시기에 만들어졌을 가능성이 높다. 미륵사지 발굴조사를 토대로 다른 동반 유물과의 비교를 통해 이 향로가 858년 이전에 매납(埋納)되었다는 견해는 이러한 편년을 적극적으로 뒷받침해 준다. 이 작품은 출토 경위가 확실하며 완벽한 보존 상태를 지닌 작품인 동시에 우리나라에서 첫 예가되는 통일신라의 금동 수각형 향로라는 점에서 큰 의의가 있다. 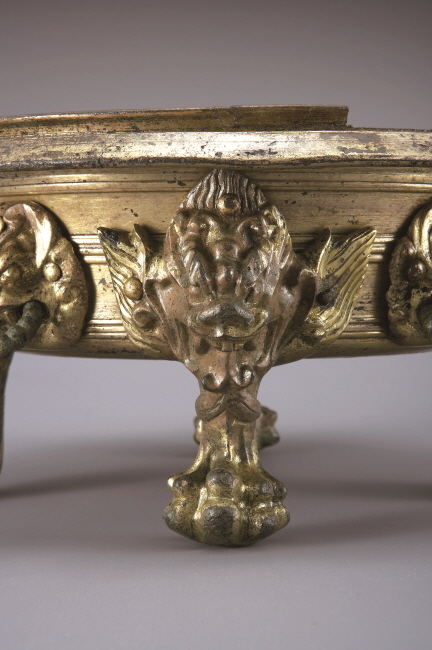 The legs of the Gilt-bronze Incense Burner from Mireuksa Temple Site resemble those of incense burners made in the Tang Dynasty of China, which were modeled after the legs of animals. 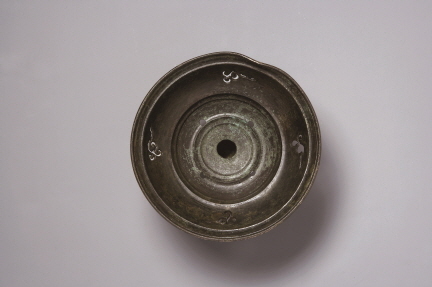 The incense burner also features a lotus design and loops with animal faces, which have also been found on sarira reliquaries excavated from Mireuksa Temple Site, indicating that it was produced by accepting a variety of artistic styles during the early Unified Silla Period. 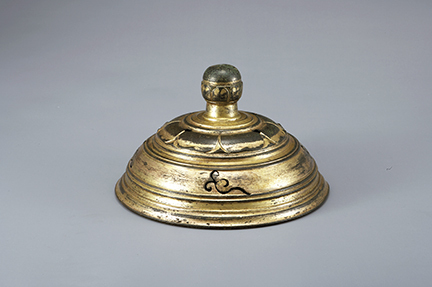 Also, it was made with gilt consisting of gold, copper and amalgam, like other gilt-bronze incense burners made in the Baekje Period. 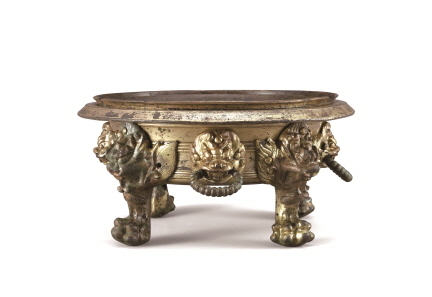 This incense burner has been preserved in perfect condition, and is significant as the oldest gilt-bronze incense burner with animal legs dating from the Unified Silla Period to have been discovered to date.